Gold mining dates back to pre-history as gold has been coveted by man since before recorded time. Its physical beauty, rarity and ease of manipulation into ornaments is likely what created its initial value, but its use as money throughout human history is what drove most of its demand over time. The Bre-X scandal back in 1997 at the dawn of my equity research career taught me to heed Mark Twain’s quote when examining mining investments. Bre-X Minerals supposedly found an incredibly prolific ore deposit in Busang, Indonesia. The grade samples taken by independent auditing geologists tested for very high levels of gold at the location. The company’s market capitalization shot up to $6 billion dollars very quickly, which made it one of the most valuable mining companies in the world at the time. As it turned out, the promoters perpetrated the fraud using an old trick. They filled shot gun shells with gold dust and shot into the soil at the location. When the auditors showed up to do their sampling work the soil was filled with gold and the reports came in great. However, eventually the scheme was discovered and the stock collapsed. As I continued to study the mining business it became apparent that one does not need fraud to lose money in gold mining shares. Many management teams do so consistently in ways that are perfectly legal. They often are simply too optimistic about their prospects. Think of everything that must go right: ore grades, metallurgy, mine costs, labor prices, gold prices, and tax regimes in often sketchy jurisdictions. Frequently, even if a company finds a workable ore body and manages to exploit it profitably, there is still the risk that the management team takes the cash flow generated from that mine and blows it on the next one where things do not work out as planned. In a recent Trends & Tail Risks strategy piece, our Chief Investment Officer, Lewis Johnson made the case why we believe that now is a good time to increase ownership of gold. Interested readers can find the article at the following link. Today we intend to delve into what our research team believes is the best way in which to invest in gold. There are several ways. One can invest in gold directly through physical gold. That is not an unreasonable thing to do but certainly involves storage costs and a tax rate that is always the highest marginal rate for individuals, regardless of the length of time it’s owned. There is also the gold linked exchange traded funds (ETFs). Shares in ETFs are easier to buy and sell but have the same sub-optimal tax treatment and the cost (negative carry) of the management fee of the ETF. We believe that one of the best ways in which to enjoy gold’s diversification benefits is through equity ownership of select gold equities. Such equities enjoy the most favorable long-term tax treatment and some pay dividends to shareholders, unlike the negative carry investors must pay to own an ETF, or the storage costs for physical gold. The complication, as noted above, is that it’s not easy to find the appropriate investments in this sector. Many companies’ management teams have proven to be uninspired capital allocators and stewards of capital. Since 1984, the XAU Index, which is the longest existing and most widely used index of leading gold companies, has declined 9% while the price of gold has increased 243%! This is one of the key reasons that we have remained so circumspect about our gold-related investments, seeking out the few that we believe to be the ones that can add value. We believe that our research team’s years of experience, research and understanding of the mining business has helped us uncover a few gold companies that are appropriate to own, particularly when we want to own gold for sector allocation purposes. Our focus, in these instances, is to identify those investments that have consistently grown profitably regardless of the price of gold and may grow even faster when the price of gold appreciates. Long-time readers of Lewis Johnson’s Trends and Tail Risks will be aware that we have, for the reasons above, long favored the royalty sub-sector within the gold sector for our investments. One such company in that sub-sector is Royal Gold Inc. (RGLD). Royal Gold is the oldest publically traded gold royalty company in the United States. Royalty companies do not own operating mines, nor do they explore for new gold deposits. What they do is provide capital to gold producing companies in exchange for a royalty interest in the gold that is produced. They are financiers of the gold industry, its venture capitalists if you will. Done correctly, this can be a more lucrative business than owning assets directly for several reasons. First and perhaps most important, a royalty company is typically able to diversify its capital out over far more mines than an operating company. Thus, the company should be less vulnerable to any one bad event at a mine. Mining operations often suffer cost over-runs and higher than expected operating costs, not to mention the all too prevalent accidents, natural disasters or political changes that negatively impact the operation. So diversification over many mines can be very helpful to long-term success. Furthermore, if negative events only impact the costs at the mine, but not production, then the royalty company will be unaffected because it receives a royalty on the mine’s production. Typically, a royalty company is not impacted by the need for more capital to operate the mine or higher costs. Similarly, the business is not capital intensive. The royalty company only invests what it wants to obtain its royalty interest. It does not own the assets or need to maintain the assets. Royal Gold has been very good at generating value from this business model. One dollar invested in the company on the first day of 1995 is worth $14.70 today, an annualized growth rate of 11.1%. 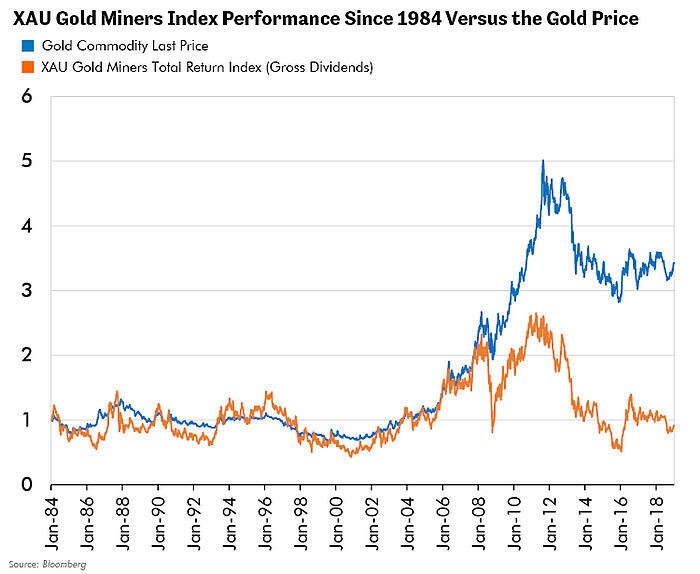 $1 invested in the XAU Gold Miners Index would be worth $.89. During that time, the price of gold grew 5.2% on an annualized basis. Not only has the company trounced the gold mining indices and the price of gold, but Royal Gold has even outperformed the S&P 500! A rare feat for a company in that sector. What is most interesting is that Royal Gold seems to have underperformed the actual value it created. As the table below shows, book value per share plus dividends per share have grown at an annualized rate of 18.6% since 1995, a rate even faster than the return to shareholders noted above. Keep in mind that this was all done in a period when gold only appreciated 5.4% on an annualized basis. We believe this evidence supports our conclusion that the management at Royal Gold knows how to execute well. They have been doing so successfully for a long time. If they continue to do so, buyers at the current stock price may benefit from not only their good stewardship but we believe the tailwind from higher gold prices that we expect. We find the stock’s current valuation un-demanding. It trades very close to its ten-year average price to book value relative to the S&P 500 Index, for instance. Our research team believes that now may be the time in the cycle for gold’s diversification value to shine. But not all gold-related investments are equal. Physical gold, the ETFs, and the 1,500 global gold equities present investors with many possible investments. We draw upon decades of experience in the gold sector to decide how best to maximize the upside, while limiting our downside. Experience has taught us that we must consider the downside - what could go wrong - as a key part of the investment process. We do not take these risks lightly as we know that this sector's companies can often destroy value and disappoint their investors. So, we apply our disciplined research process of deep and intensive research. Our goal is to try to find those companies that we believe will, over time, increase value regardless of market conditions for their product. Often, they are very difficult to find. We think we may have one in Royal Gold, as we seek what we believe is the valuable diversification of gold deep into one of the most extended economic cycles in post-World War II history.